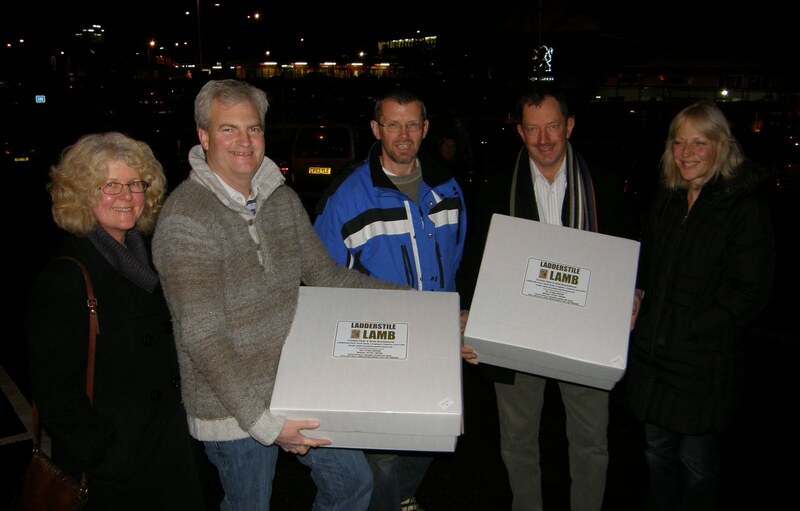 The first 10 members took delivery of 8 half lamb boxes at 6pm on Thursday 25th November at the Waters Green Tavern. The Waters Green Tavern was chosen because of its central location, easily accessible for the train and bus stations and with nearby parking. This is much better than people driving out to the farm every month and will make it more accessible for everyone. Brian McDermott, landlord at the Waters Green Tavern is happy to have the pub used as a “food hub”, as it brings new customers to the pub at a relatively quiet time. In fact, Brian has also joined the Lamb Buying Group himself. Food4Macc Direct would like to expand the lamb buying group in time for the next delivery in January, but is already planning further products, including other meat, poultry, vegetables, fish and artisan bread. If you would like to find out more about Food4Macc Direct or join one of the buying groups, send an e-mail to direct@food4macc.org or call Tim on 01260 253987. 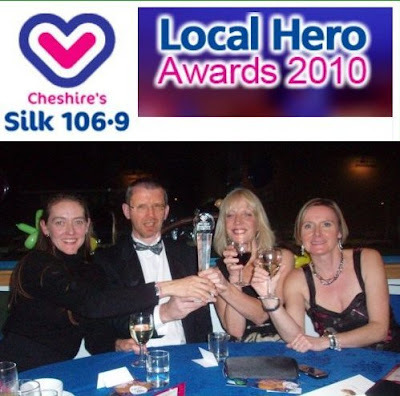 Food4Macc has won the Local Hero-Social Enterprise of the Year in a poll of Silk 106.9 listeners. Accepting the award on behalf of Food4Macc, Secretary Debbie Townend paid tribute to the hard work of Project Leaders and Volunteers over the last year. Pictured are Viginie Adamski, Philip Shaw, Debbie Townend and Sarah Wreford. 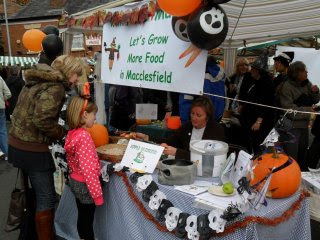 The organisation has recently started working with local farmers, and had been instrumental in the formation of a new group to look at the whole issue of planning a sustainable future for Macclesfield, possibly leading to the start of a Transition Town movement here. Last night Food4Macc devoted its regulary monthly public meeting to a discussion led by Nicola Percival of Bollington Carbon Revolution . We were pleased to see many new faces, and the meeting generated lots of ideas about what we could do individually and collectively to reduce our carbon footprint - and save ourselves money as oil prices rise inexorably. Food4Macc attended the October Treacle Market in Macclesfield, with a stall that offered tasting of several different British apples, a demonstration of an apple slinky maker, and some fascinating treats made from surplus fruit by our trained chef, Philip Shaw,and a colouring competition.